Miss Lulu, acrylic 36x24, has been signed--that means she's finished. I hope. This image will be used for the Holly Springs NC invitations/announcements, a project which needs to be done this week. I'm not sure I like Miss Lulu looking at me with those scissors in her hand. Luckily, I don't have a beak. She was a nice lady but the story got stuck in my head. Here in Southern Virginia relaxing is an art. The spiders, however, are always busy. This is one of my small sculptures--Of Two Minds (the heads are interchangeable). She hasn't changed her mind in several years; she just hangs out on the porch of my workshop. The seven paintings above will be going to new homes, and I sold one piece of sculpture--Woman (black soapstone). 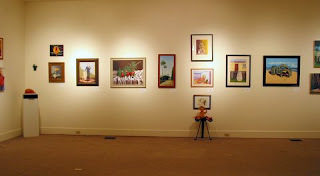 These are part of the art exhibit at MacCallum More in Chase City VA, which is on display until the end of July. 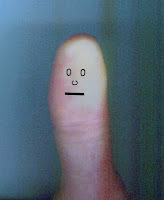 I always have mixed feelings about selling; I'm happy people like them enough to buy but parting is never easy. Each one represents a chunk of my life. There are ten feet in my yard--six lefts and four rights; they were in the bottom of my 40's shopping cart which is in the workshop. Since I don't like even numbers, I'll have to eliminate one or buy another one. These could be feet for the ducks or feet for the newel posts. 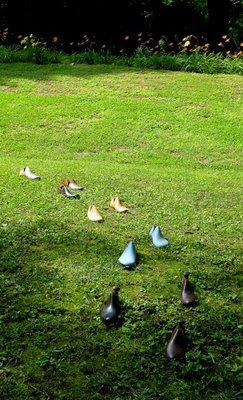 Some appear to be made of walnut and one pair is painted blue. A wrought-iron tea cart (an auction find) was missing its two small back wheels. The feet worked well; I named it "Blue Suede Shoes Cart" and used it in my living room. Give junk a title and it becomes art! Tomorrow I will go to MacCallum More Gardens and open the Museum/Exhibit at 2 p.m. People have visited the Gardens to see my work and were disappointed when the Museum was closed. I don't mind hanging out in such a beautiful place; I'm equipped with camera and sketch pad. The above photo was taken last Sunday. I cleared a path to my easel and am working on a new painting. 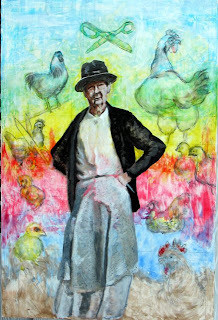 "Miss Lulu" (36x24) began with charcoal-drawn chickens and many layers of acrylic gels and paints. 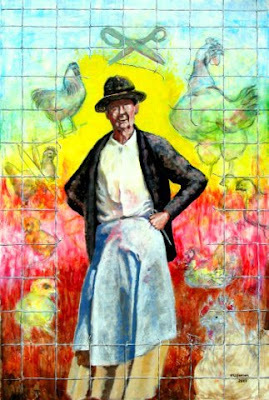 I added Miss Lulu Thursday and she has the correct attitude; much remains to be done, including darkening the bottom with burnt sienna, and Miss Lulu will be seen through broken chicken wire. As a child I knew her--she dipped snuff, wore men's shirts, hats and sweaters (maybe that's where I got my sense of style), and her husband Charlie always opened the truck door for her. My mother told me that she had cut off her chickens' beaks with scissors so they wouldn't peck at her garden seeds. Despite the story, I liked her. 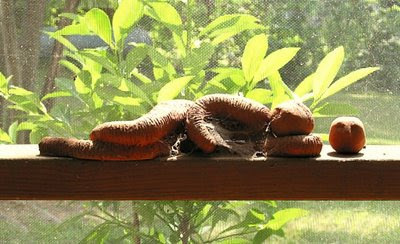 Sweet potatoes are my favorite houseplants. This photo needs a caption...any ideas? At the local vegetable stand, I asked why the tomatoes are displayed bottoms up. "We've always done it that way." I suspect it's to prevent their rolling off the counter but it slows my shopping. Last year I found a one-of-a-kind tomato; spent two days photographing it; stored it for six weeks; then photographed it to show age. It was a great model. Now each tomato has to be turned over. 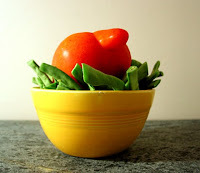 I grew up in the country, I'm familiar with the slow food concept--I'm more into the slow shopping movement. Friends. Friends showed up. Friends bought paintings and sculpture. Friends brought arrangements for the tables and roses for me. A beautiful young woman played the violin. Relatives. 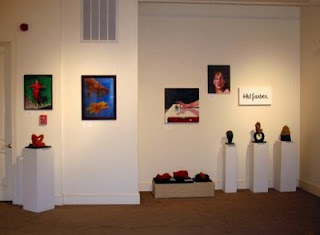 My brother and sister-in-law formerly owned a gallery in Pasadena CA; they helped me set up the exhibit. 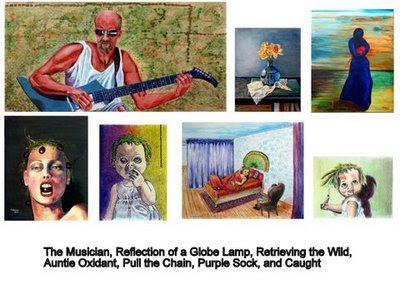 My sister-in-law is also a former restaurant owner who had introduced my paintings by hanging them on her walls; she served great food with flair at the opening. Location. 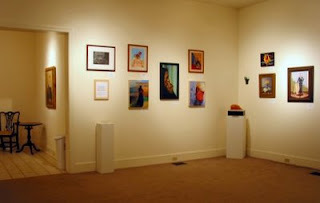 My exhibit shares a Museum with an extensive Native American artifacts collection, and with a tribute to the Thyne Institute, which began educating African Americans in this county in 1878. 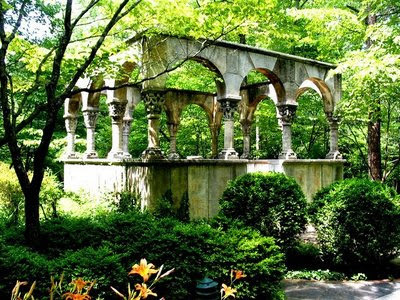 The Museum is part of the five-acre organically-maintained MacCallum More Gardens which was begun in 1929 by Lucy Morton Hudgins, wife of Edward Wren Hudgins, former Chief Justice of the Virginia Supreme Court. Their son, William Henry Hudgins, expanded the gardens until his death in 1986. 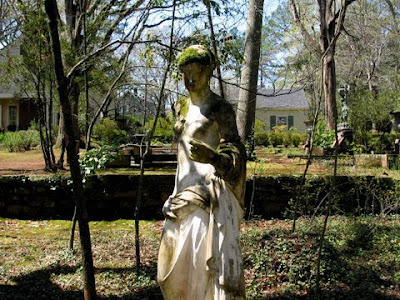 Sculptures, stone walls, friezes, ponds with frogs and goldfish, innumerable plants and trees, birds and butterflies, places to sit and meditate--all in Chase City VA! It's a wonderful way to spend a day. The photo below is one of the Gardens' many beautiful sculptures--it was taken just after a light shower and before the dogwoods bloomed; I love the moss. The Museum, exhibit and gift shop are open Mon. thru Fri. 10 to 5 and Sat. 10 to 1. The Gardens are open every day 10 to 5.
the cards say it all. so I'm writing a rhyme. After three full days of back-breaking work--by my sister-in-law, my brother, and me--the exhibit at MacCallum More Museum and Gardens is ready for tomorrow's opening. Title cards on the wall, glass cleaned, business cards printed, artist statement finished, pedestals in place, sculpture polished and guest book ready. Whew! 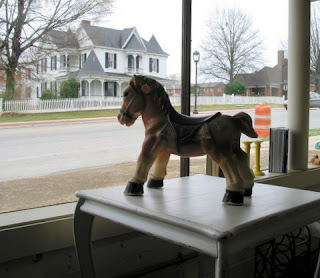 This little horsie is happy--the mud in front of his antique shop is being replaced with a new sidewalk. He's antsy to get out and gallop in the sun. I had a horse like this in my studio in MD and set him free when we moved to VA. I didn't bring this one home--just photographed him when I was shop-sitting at Strum & Co.